The fun ride enjoyed by Israel with Trump in the driver’s seat saw Netanyahu grinning with glee. Announcement about Jerusalem as the undivided capital of Israel; the relocation of the US embassy from Tel Aviv to Jerusalem; ongoing military and financial aid without accountability; unconditional leverage at the UNSC to protect Israel and turning a blind eye on the atrocities committed against Palestinians, all added to the free ride at the expense of America’s tax payers. 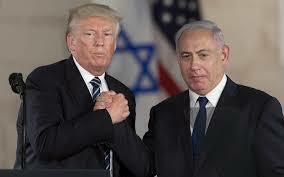 Neither Trump, surrounded by rightwing hawks, nor Netanyahu and his racist coalition, have felt any sense of embarrassment at the fact that the ties between the two countries are deeply embedded in extraordinary ways, well beyond acceptable diplomatic standards. The consequences of the American departure are dire for Israel. From Netanyahu’s perspective it conflicts directly and severely with his position. His insistence that the agreement with the Pentagon whereby any withdrawal of US troops would be contingent on the removal of Iranian troops, has apparently fallen on deaf ears. That there are no bargaining chips left for Israel and with Moscow, Istanbul and Tehran firmly holding the cards in Syria, all Netanyahu can do, apart from privately gnawing his teeth, is wreak vengeance and havoc via his bombers. Isolated and marginalized, not only by the Trump administration, but also by his Arab despots who are clambering over each other in a rush to curry favor with Assad, Netanyahu will be deeply frustrated and humiliated. Does it raise questions about the future sustainability of a colonial project which is dependent on collaboration with dictators and an ill-advised American president surrounded by extremists who extol racist rightwing practices? Of course it does. And the negative impact on its future is evident from disgruntled Israelis to equally disillusioned Jewish activists across America and other parts of the world. In fact, the obscene number of guffaws emanating from Trump, makes him a liability for America’s future. Stunning thus to observe how the impending doom of both administrations – Trump’s and Netanyahu’s – is intertwined. Any “wish list” Netanyahu may have cherished for 2019, will end in despair, defeat and humiliation.